The ecommerce market in Latin America is flourishing. This is the perfect opportunity for businesses that are looking to expand. 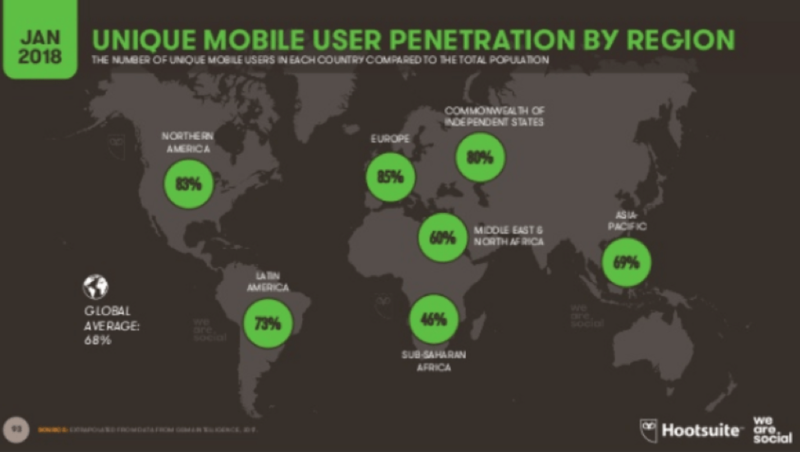 In fact, Latin America is the global leader in ecommerce growth, especially when it comes to mobile ecommerce. That’s right. When it comes to ecommerce sales growth, Latin America is home to two of the three fastest-growing countries in the world; Colombia and Argentina. Colombia’s ecommerce growth is rising by 31% annually, while Argentina is growing at a rate of 24%. Furthermore, these countries have a 64% and 45% annual increase in mobile commerce sales, respectively. Those are just two of the 33 countries in Latin America. But there is a similar pattern across the entire region. As a business owner, you need to recognize these trends and adapt accordingly. If you’re currently selling products in Latin America, it’s time to expand your business with ecommerce. Some of you may have already made this decision, but you’re just not sure how to proceed. Well, you’ve come to the right place. For those of you who are looking to sell products online or choose an ecommerce platform in Latin America, you’re going to need some guidance. By working with a company that specializes in ecommerce development, penetrating a booming market that’s primed for ecommerce sales will give you an advantage over your competitors. As we continue through this guide, I’ll explain why this is the perfect opportunity for businesses to thrive in the Latin American e-commerce market. You’ll also learn what to look for when choosing a platform and company that will set you up for success. In 2019, experts estimate that over 155 million people will buy products and services online in Latin America. This number is up from 126.8 million people just two years ago. How does this compare to the rest of the world? As I said before, nobody is growing at a faster rate than Latin America. But with that said, the average number of online transactions per capita in this region ranks last compared to other parts of the globe. But don’t let those numbers discourage you. The important figures to focus on here are the growth numbers. 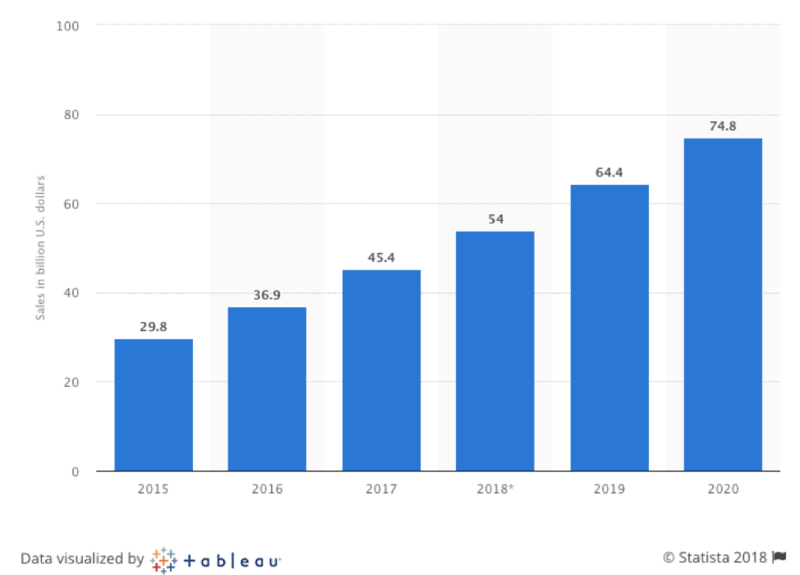 It’s also worth noting that the e-commerce industry as a whole is growing each year across the globe. By looking at this graph, you can see that Latin America ranks fourth in terms of B2C ecommerce sales by region. Do I expect Latin America to move ahead of Asia-Pacific or North America on this list in the next few years? No. But with that said, it doesn’t mean that there isn’t a huge opportunity here for ecommerce businesses. Here’s something else to consider. 54.6% of consumers in Latin America have made a purchase from an overseas retailer in the last six months. First, buyers are willing and able to shop online for products being sold by businesses outside of their region. That’s the beauty of the Internet. So if you don’t adapt and launch an ecommerce store now, your target market will go elsewhere for their needs. However, more than 92% of consumers prefer shopping on ecommerce platforms that display prices in their local currency. This means that you’ll have an advantage in this market compared to businesses from other regions. Second, businesses with existing ecommerce shops can expand by targeting consumers in Latin American markets. 33% of shoppers abandon purchases if the only pricing option is in US dollars. So even if you already have an ecommerce business in the US, you’ll still need help penetrating the market in Latin America if you want to expand and target a growing region. Any time you’re starting a new business venture, marketing strategy, or expansion plan, the first thing you need to do is identify who you’re going to target. On paper and in theory your idea might sound great, but you need to actually do some research first to determine if there’s a market for your products and services. It all has to start with the consumer. What are you offering that meets the needs of your target audience? But you need to understand the demographics of your target market before you can proceed. This can be a bit of a challenge when you’re targeting a such a huge section of the world. As I said before, there are 33 countries in Latin America. In South America alone, there are 448 languages spoken. The people of Latin America have different religions, backgrounds, beliefs, and spending power. So you need to find ways to narrow down your target market. Start broad. Look in areas where people have access to purchase products and services on the Internet. The percentage of unique mobile users in Latin America is higher than the global average. So the technology is there for them to use. But not every with a mobile device necessarily has Internet access. Let’s break this down even further. Latin America can be segmented into three sections. In terms of Internet penetration by area, South America leads the way with 68%. Central America and the Caribbean have a 61% and 48% Internet penetration, respectively. Another important factor for ecommerce businesses to consider is social media usage of consumers in their target market. Once your ecommerce shop goes live in Latin America, you want to be able to find as many ways as possible to engage with your audience and market your brand. So your social media strategy will be crucial to your success. 63% of people in South America use social media. 59% use it in Central America, and 40% of the Caribbean population is on social media. Now that you have a better understanding of the areas within Latin America with the highest percentage of Internet and social media penetration, you can start to make more informed decisions about the exact demographics you want to target. Working with an e-commerce Internet marketing company can help you with this. But we’ll talk more about what to look for in this type of company as well as go into greater detail on the top markets to target in Latin America as we continue through this guide. One of the first things you need to do when you’re starting an ecommerce operation is to pick a platform. But in today’s day and age, there are hundreds of different options to choose from. This can be extremely overwhelming, especially if you’ve never done this before. I’ve narrowed down some of the top options for you to consider. 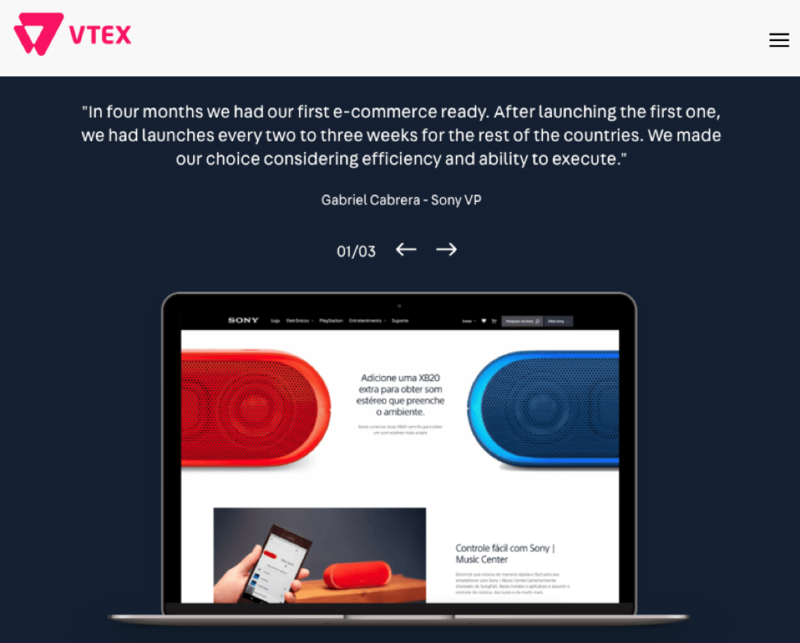 VTEX is cloud commerce platform. With some help, you can set up your online store very quickly. Every business is different. This platform recognizes that there is not a one size fits all solution for every ecommerce store. That’s why they let you customize your store based on your business needs. You’ll also be able to build an ecommerce store based on your brand’s industry. One of the best parts about this software is that they make it easy for you to launch multiple stores for specific countries after your initial ecommerce site is built. This is extremely helpful when you’re operating in an area with more than 30 countries, like Latin America. Optimum7 is a VTEX Developer and Partner. Shopify makes it easy for businesses to sell products online, as well as through social media platforms. This is important to keep in mind. We already talked about social media penetration throughout Latin America. So if your company plans to drive sales with social commerce in Latin America, Shopify will be a top option to consider. Your ecommerce store is fully customizable. Shopify offers features that allow you to easily manage your inventory as well. They have one of the most popular and reputable platforms available on the market today. Optimum7 has been a Shopify Partner for over 8 years. 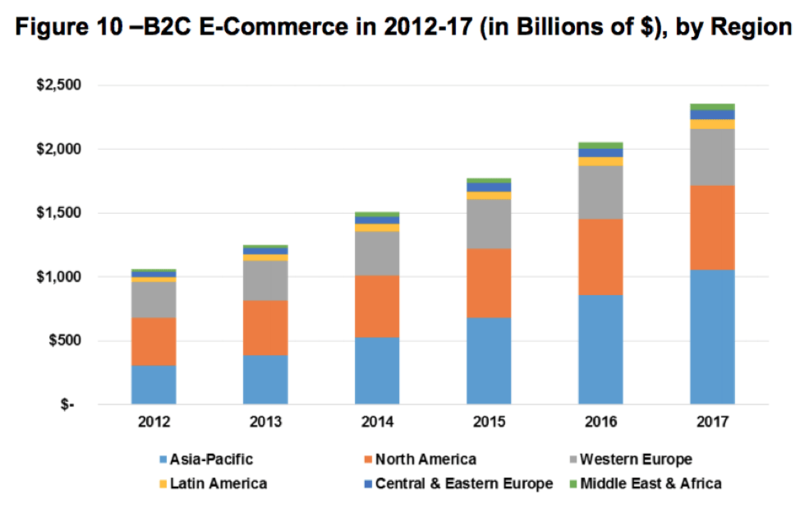 BigCommerce is a global leader for ecommerce and shopping cart platforms. In addition to creating, customizing, and managing your own site, BigCommerce allows you to list products on other platforms such as eBay, Amazon, and Facebook. They have different solutions available based on the size of your operation. The software specifically helps businesses that are growing at a fast rate with tools that will increase sales. But once your company becomes a high-volume ecommerce shop, you can upgrade to the BigCommerce Enterprise solution. Magento is a great choice for those of you who want to bring your ecommerce shop to market as fast as possible. Their small business packages are ideal for local brands in Latin America looking for an ecommerce platform. With that said, this platform is also beneficial for those of you who operate as a B2B company. They have specific features for global expansion. This will allow you to penetrate new markets as quickly as possible as you target new countries throughout Latin America. Optimum7 is also a Magento Partner. Larger companies may want to consider solutions offered by SAP and Oracle. These platforms are available for both B2B and B2C ecommerce companies. The SAP platform uses intelligent enterprise solutions to manage data from multiple sources, which will ultimately help your ecommerce store grow. As I’ve continued to state throughout this guide, the opportunity for businesses to launch an ecommerce store in Latin America is right there for taking. Let’s look at some valuable information. Right now, these are the top retail sites that are currently operating in Latin America. As you can see from these figures, the majority of the sites on this list are from big players that operate on a global level. This means that there is plenty of room and opportunity for smaller businesses to penetrate the market. Whether you’re looking to start a new ecommerce shop or expand your existing one to new markets, this information should be extremely encouraging to you and your business. Retail ecommerce sales in Latin America are rising each year. As you can see from the graph, they will continue rising in the coming years. But as I said before, Latin America is huge. It’s better to break it down by specific areas when you’re trying to determine the opportunities for your company. I’ll start with Central America. Let’s look at the annual growth percentage of Internet users in each country from 2016 to 2017. If you take Costa Rica out of the equation, the remaining six countries in Central America saw an average of 31% growth in Internet users. That’s just over a period of one year. There are roughly 16 billion Internet-connected devices in the Caribbean. That number is expected to reach 29 billion by 2022. Based on the information we’ve seen throughout this guide, the Caribbean is growing at a slower rate compared to Central America and South America. If you have a business that operates in a Caribbean country, you can still launch an ecommerce shop to expand your reach to other islands. Once you penetrate those markets, you can think about expanding to other areas of the region in the future. Mexico and Brazil are going to be the next big markets in Latin America. Mexico alone has more than 76 million Internet users. From 2016 to 2017, Mexico saw a 27% increase in their population using the Internet. Furthermore, this country benefited from a 33% rise in mobile users and a 27% increase active social media users. All of these trends will benefit their ecommerce performance. Last year, there was $8.72 billion in retail ecommerce sales in Mexico. 45% of mobile shoppers in this country use their device to shop online at least once per month. Brazil is one of the top ten largest ecommerce markets in the world, with $19 billion in annual online sales. By the end of 2018, that number is expected to reach $21.29 billion. Your ecommerce company will thrive if you can successfully penetrate and target the markets in Mexico and Brazil. Why Work with a Company Like Optimum7? Now that you’ve recognized the opportunity and you’re ready to proceed with an ecommerce shop in Latin America, it’s time to decide how you’re going to achieve your goals. Optimum7 has over 15 years of experience in ecommerce, with extensive knowledge of the markets in Latin America. We also have expertise in multiple platforms, including the ones that were discussed earlier in this guide. You need help from a company who knows this industry. Find someone with a track record of helping ecommerce companies grow. An expert in the ecommerce industry we’ll help you with every aspect of your business. I’ll briefly discuss the areas that you need to keep in mind when you’re making this type of decision. Setting up your ecommerce shop is only a small portion of what it takes to be successful. You need to find a company who can assist you with the daily operations of running this type of business. A company like Optimum7 can help you determine how to package your products for shipment and assist you with things like inventory or drop ship. We’ll assist you with UPCs and barcodes. Our services ensure that you’ll be able to handle all of your operations as your company grows and e-commerce orders come in at a higher rate. As orders come in, they need to be fulfilled. This needs to be done properly in order for you to be successful. All of this relates back to how we can set up your operations function at an effective level. By properly fulfilling orders, it will help your company avoid eCommerce chargebacks. Your customer support can make or break the success of your company. It doesn’t matter what you’re selling, or how good your products and services are. Without good customer service, your ecommerce business will struggle. 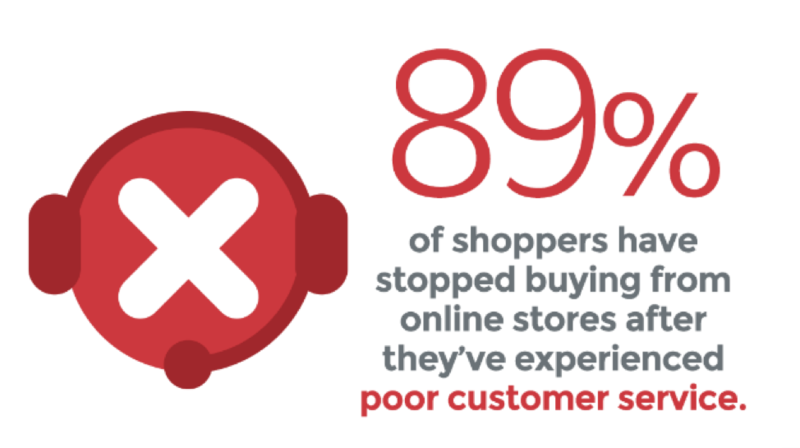 Studies show that nearly 9 out of 10 customers will stop buying from an online store if they have a poor customer experience. Furthermore, 52% of people who have a bad experience will tell their friends and family what happened. This isn’t something you want to happen to your company as you’re entering a growing market. On the flip side, providing excellent customer service will have a direct impact on driving sales. So your website is live, and ecommerce platform is set up. Now what? You can’t automatically assume that sales will start pouring in. You need to find ways to drive traffic to your website. In addition to helping you choose a platform and build your online shop, Optimum7 can help your organic search ranking rise through ecommerce SEO strategies. When people search for keywords and phrases related to your products and services, it will be much easier for them to discover your brand. You need to market your business on as many platforms as possible. Content is king. Not only will content help you with SEO, but it will also provide you with resources to use for your email marketing list and social media profiles. We can help you reach your specific target audience with the appropriate content marketing campaigns that directly drive sales. Integrating your e-commerce store to your existing business operation is not an easy task if you’ve never done it before. You’ll need help from a company who has been through this process with hundreds of clients in the past. If you already have an existing operation, but you’re looking to switch platforms with an ecommerce migration as you expand in Latin America, we can help you with that as well. Your e-commerce store has been built, and you’re driving traffic to your website. But that traffic means nothing if it’s not translating to sales. We know what it takes to maximize the conversion rate optimization for e-commerce stores. High conversion rates result in more money in your pocket at the end of the day. There is a thin line between making money and losing money in Ecommerce. Most of this has to do with visibility and traffic. However, conversions and E-commerce functionality also play a huge role. At Optimum7, we have over 600 e-commerce functionalities that we have built for all these platforms. 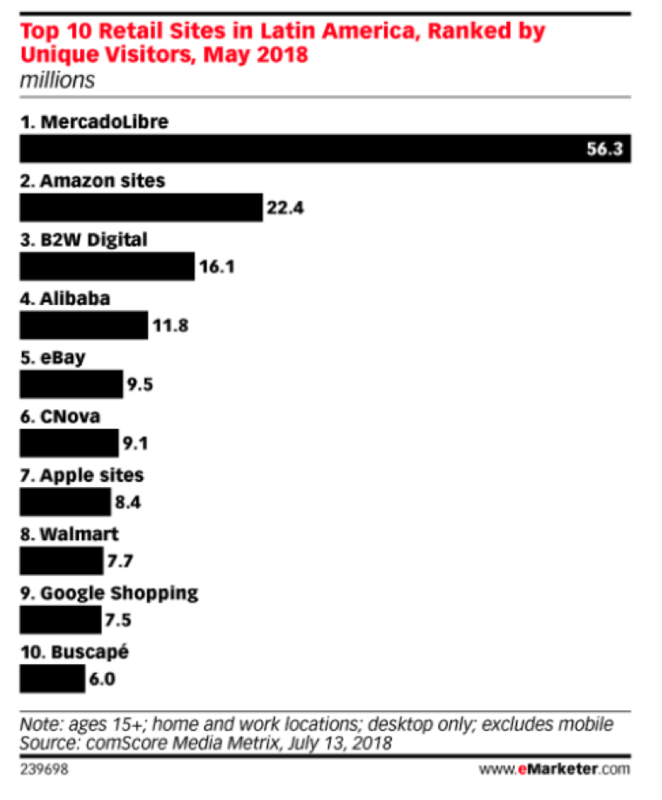 The ecommerce industry in Latin America is booming. As a business owner, this is the perfect opportunity for you to penetrate a growing market. Whether you’re looking to do ecommerce in Latin America or trying to figure out which platform is best for your business, you can use this guide as a reference as you plan and execute your strategy. Furthermore, you might also be looking at M&A (Mergers and Acquisitions) options and consulting for Ecommerce. In order to make this process go as smooth as possible, you’re going to need help from a company who has been through this process before. At Optimum7, we are headquartered in Miami, FL and can assist you with your E-commerce expansion into Latin America. Contact us, and we would be happy to answer any questions you have about growing your business with e-commerce in Latin America.